Have you ever thought back on a particular year in your life and reflected on how significant that one specific year was? Well, Noah sure did! As a result, he gave us a lot of detail for a significant year of his life - that is, the year of the Flood. In fact, I believe no other year in the Old Testament (almost 4000 years of history!) is better chronicled than the year of the Flood. Specifically, Genesis 7:1 to 8:19 provides the chronicled account. Note: I take the view that Moses was compiling the various ancient accounts passed down from Noah and others in the book of Genesis. This view is supported by the use of the Hebrew word transliterated as toledoth (Gen 6:9 – translated as account, history, or genealogy by various versions). The word toledoth in Genesis appears to be a signpost for the start of the various accounts Moses was compiling. Also, the explicit details given for the Flood account seem more natural as the recordings of an eyewitness than something God detailed for Moses after the exodus concerning what Noah went through. However, God directly dictating the account to Moses would clearly still be an acceptable view that upholds the inerrancy of the Scriptures. Either way, God specifically wanted us to have the details. 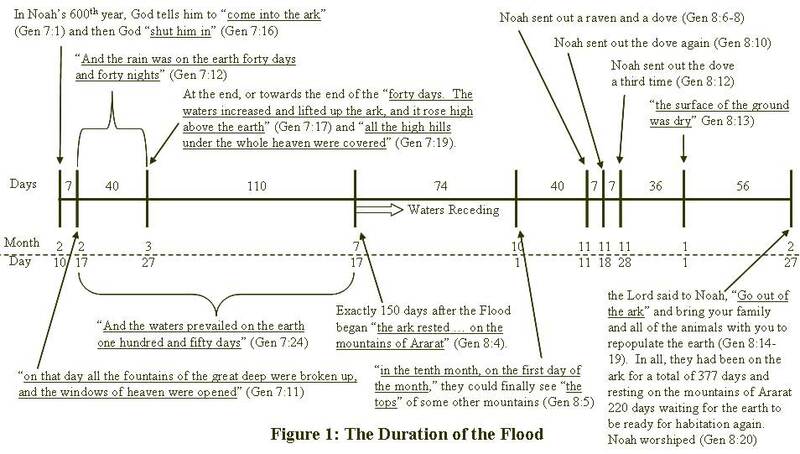 So why did God want us to have this explicitly detailed and chronicled account of the Flood? Maybe it was to make crystal clear the seriousness of God’s judgment on sin and to ground the event of the Flood in real earth history. Both of these messages are important today given our culture that rejects this past judgment, no longer fears the coming judgment, and a church that is trying to turn the global Flood into a local Mesopotamian event. Therefore, let us take a minute and look at the details Noah gives us concerning the year of the Flood. Note: a detailed illustration of the following timeframe can be seen in figure 1 below. Noah waits another 36 days after the dove does not come back to remove the covering of the ark and clearly observe that “the surface of the ground was dry” Gen 8:13). Noah was now 601 years old and it was “the first month, the first day of the month” of a new year for Noah (Gen 8:13). They had been in the ark for a total of 321 days and the ark had been resting on the mountains of Ararat for 164 days. Yet, God was still not ready for them to come out of the ark. For it was another 56 days “in the second month, on the twenty-seventh day of the month” before the Lord said to Noah, “Go out of the ark” and bring your family and all of the animals with you to repopulate the earth (Gen 8:14-19). In all, they had been on the ark for a total of 377 days and resting on the mountains of Ararat 220 days waiting for the earth to be ready for habitation again. Wow, what a difference a year can make! Actually, one year and seventeen days to be exact. I can see why these details were so clearly impressed upon Noah and recorded for us to contemplate the extent of God’s judgment. There is no doubt here regarding the global nature of the Flood. Also, it is interesting to think that only recently has man been so involved in studying the multitudes of earth’s strata. Too bad most are blind to the picture of judgment that the earths geologic column contains. For the Flood dramatically changed the face of the earth. Burying tons of plants and animals and creating the strata, separating the continents, creating the fossil fuels, and fossil record that we see today. Contemplating these events as well as the decades Noah and his family spent building the ark, one can clearly see why Noah has such a prominent place in the record book of faith as noted in the New Testament – “By faith Noah, being divinely warned of things not yet seen, moved with godly fear, prepared an ark for the saving of his household, by which he condemned the world and became heir of the righteousness which is according to faith” (Heb 11:7). What we need to do now is clearly teach and proclaim these truths of the duration and description of the Flood as described above. The true story of earth history as found in the Bible is what we need to use to counter the naturalism that is dominating our culture and undermining the authority of the Word of God to those around us.